I should have – I would have – I could have – I didn’t. Why did I not??? Does this sound familiar to you? So many persons around me regularly dive head-first into a deep pool of guilt – because they work too much and/ or don’t get enough work done, because they don’t spend enough time with their children/ friends/ spouse/ dog or think they should simply be a “better person”. Conscience is a good thing as is constantly striving to improve oneself. In moderation. Feeling bad for things you cannot change, doesn’t do any good though. On the other hand, feeling bad for things you actually can change is just a waste of time (if they’re important to you, go out and change them. If not, stop complaining). 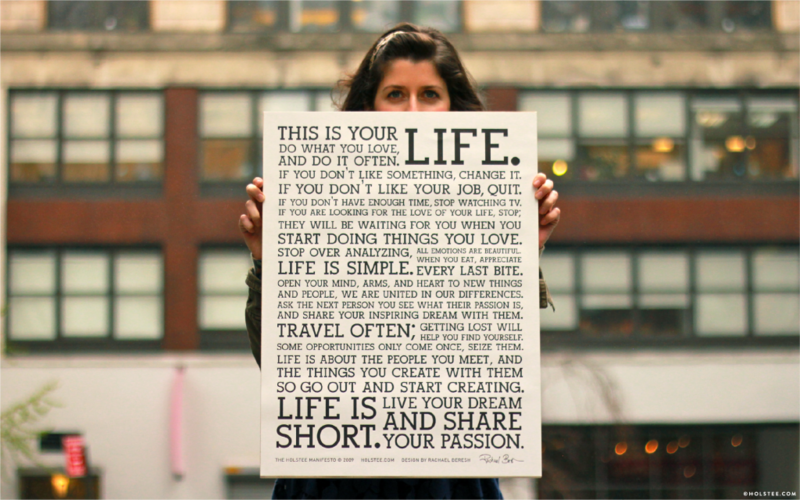 I’ll let you in on a secret: This is your life. Yours and yours alone. Therefore, it is also your responsibility what you do with it. Just like every other person you will have obligations (such as a job, children or a partner) but it is your task to handle your life to such an extent that you’re somewhat happy with the outcome. Also, there is no reason to feel guilty about doing something for yourself. I don’t mean to tell you to become an egotistical pig and brutally knock over whomever or whatever comes your way, but to lead your life in a way you are comfortable with. Because no one is going to save you if you don’t. 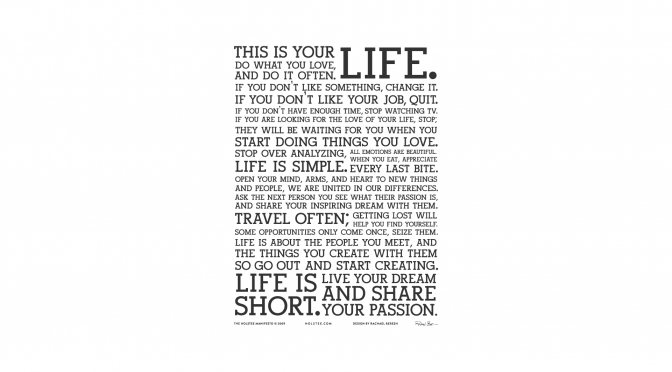 I actually have a framed print-out of the Holstee manifesto in our living room – right opposite the couch, in perfect view so I see it doing my daily sun salutations. To me, it’s a useful mantra to realign my priorities whenever I feel it necessary. It also sits on my work desk, right next to my computer screen. What is your advice in this regards? How do you deal with upcoming pangs of unjustified guilt? Please share your wisdom and experience in the comments below, I am always eager to learn.